British photojournalist and ISIS hostage John Cantlie is still alive. ISIS released a new video today of him in Mosul. He asks why the coalition forces are bombing Mosul's bridges when the only people affected are residents -- the ISIS fighters, the "Mujahideen", are on fighting on the front lines outside Mosul. He shows a destroyed bridge which make it very difficult for people to get around. British ISIS hostage John Cantlie has re-appeared. ISIS released a new video of him criticizing the United States for bombing an ISIS media kiosk in Mosul. He said the U.S. put innocent lives at risk. The video is short and has no ISIS violence. You can watch it here. 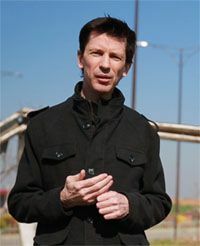 Cantlie was captured with James Foley and has appeared in many ISIS propaganda videos and Dabiq magazine articles, but none in the past year or so. I think his last video was in February, 2015. 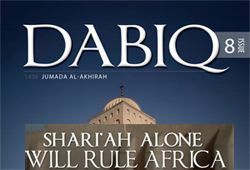 While there was an article in the November, 2015 issue of Dabiq purportedly authored by him, it isn't clear when it was written. I hope today's video means he is still alive. Just before New Years, I wondered what happened to John Cantlie. We have the answer. He's still alive. Here is his latest video giving a tour of Mosul, Iraq, which he says is the "absolute heartland" of the Caliphate and home to 2 million people." He says he sees millions of people going about their daily business after years of oppression. 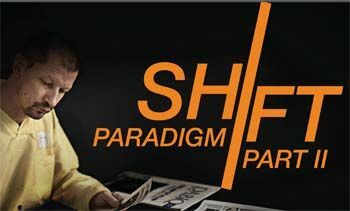 ISIS has released Issue #5 of its English publication, Dabiq Magazine. You can read it here. 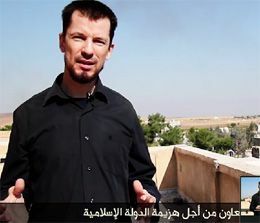 ISIS has released Episode 6 of prisoner John Cantlie's "Lend Me Your Ears" video messages. 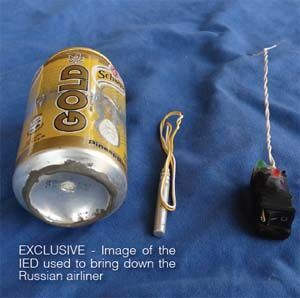 In it, he discusses the failed U.S. rescue attempt of James Foley. He excoriates the U.S. and British governments for not negotiating with ISIS, for threatening James Foley's mother with prosecution if she participated in ransom negotiations, and for abandoning him and the other foreign hostages recently executed. He says ISIS was holding six foreign hostages, presumably referring to Foley, Sotloff, Haines, Henning, Kassig and himself. He doesn't mention the female U.S. aid worker who reportedly is being held by ISIS. Hopefully, she's just being held in a different place. Cantlie blasts the hypocrisy, arrogance and lies of the U.S. and Great Britain, saying they treated his life and those of the other English and American hostages like a "roll of the dice" while the other hostages all went home. He is not angry at ISIS. You can watch the video here, but it probably won't stay up long. 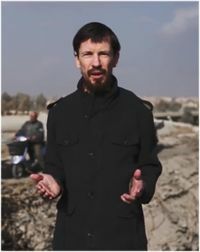 ISIS hostage John Cantlie was let of out of ISIS jail to take a road trip to Kobane to make a new video. He also got to shed his orange jumpsuit and wear a nice black shirt. You can view the video at Daily Motion here. Cantlie is quite animated as he shows off Kobane in the background and explains why the U.S. and its coalition won't succeed in controlling Kobane. His hair is longer, and while his face appears haggard, his mood is quite upbeat and his delivery is very enthusiastic. He's either gotten quite adept at using a teleprompter, or he's a naturally gifted speaker who doesn't need one. If we didn't know he was a hostage, he could easily be taken for a network news reporter. What would account for his enthusiasm? Perhaps ISIS rewarded him for his video work with a get out jail free card, rather than just a day pass. I hope so. 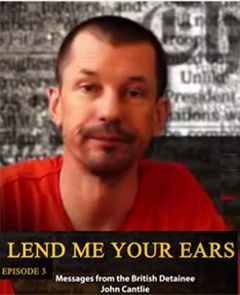 ISIS hostage John Cantlie has a new video message (Episode 3 of "Lend Me Your Ears") available on You Tube here. It's much the same message as prior videos. More interesting is a new written statement by Cantlie addressing media claims that his video messages are scripted or written by ISIS. The topic is President Obama's speech on 9/11 against ISIS. These propaganda videos are becoming redundant. What's new in this one? A flat-out denial of Obama's claim that ISIS kills innocent women and children. He says it's an undeniable fact that ISIS did not kill the Yazidi women and children of Mosul and Sinjar (whom he refers to as Christian). He says ISIS does not regard the Shia as Muslims and thinks they are worse than Americans. He says Isis regards the Shia as apostates claiming to be Muslim while worshiping the dead. After disparaging the ground forces Obama says will be assembled from reconstituted Iraqi soldiers and syrian rebels, he ends with, "For their part, the Islamic State states they welcome meeting Obama's under-construction army." 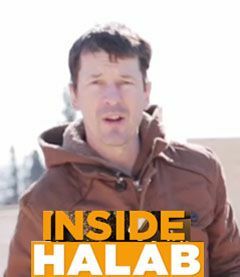 Here's the latest video message from ISIS hostage John Cantlie. Watch now, because You Tube keeps taking it down. He quotes a lot of U.S. officials and argues Obama was caught off guard and the air strikes won't succeed. He says Iran is running Iraq, and the appointment of "a new puppet" in Iraq is an important piece of the puzzle of America's Gulf War III.